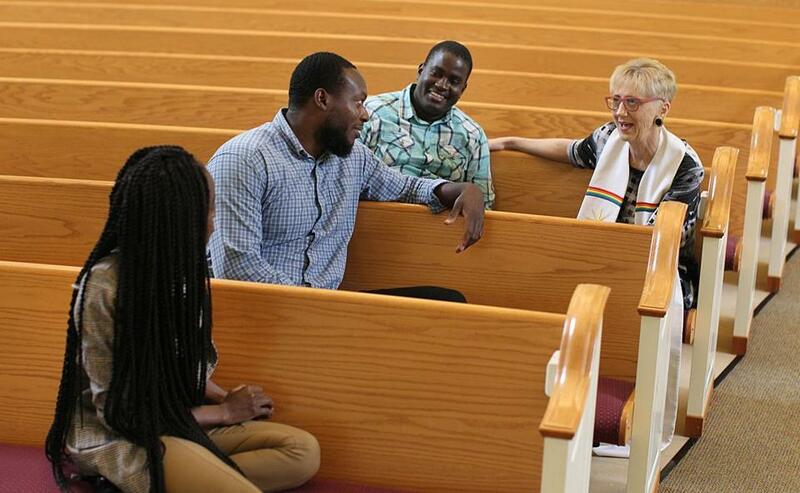 The Hadwen Park Congregational Church in Worcester helps gay and transgender people fleeing persecution in the Caribbean and Africa seek help when they arrive in the United States. Well, friends, that was one of the most soul-crushing weeks we’ve had since Donald Trump was elected. And, given that every week since has been awful, that’s really saying something. If you care about kids separated from parents at the border; if you believe in unions, or religious tolerance, or worry about Muslims, and refugees from Syria and other countries on the travel-ban list; if you value our relationships with our allies and are leery of Russia and North Korea; if you believe in abortion rights, voting rights, checks and balances, and a free press, things are damned dark at the moment. I can’t lie. I’m in a pretty bad place. On Friday morning, I found myself ferreting around online to see if any of the people who have threatened me over the years live in the area. As if that mattered. I know I’m not the only enemy of the people who feels this way. And, let’s face it, next week probably won’t be much better. Unless something miraculous happens — like the GOP Congress growing a conscience — we’re looking at months, and possibly years, of regression, erasing gains unlikely to be restored in our lifetimes. At grim moments like these, it’s easy to slide from anger into despair. The reactionary tide seems unstoppable. Anger can be a useful motivator (Vote hard, friends!). Despair? Not so much. So, to pull back from the darkness, let’s consider some of the light that remains. After a gunman killed five journalists at The Capital Gazette in Annapolis on Thursday, surviving reporters put out a paper, determined to serve their community even in the midst of their shock and grief. There are journalists all over the country, tireless and underpaid, who care deeply about uncovering wrong and giving comfort to the powerless. They do it even as Trump and others deride and threaten them. And on Thursday, thanks to attorneys who fought with all of their hearts, and a Chicago judge who saw the administration’s separation policy for the gleeful cruelty it is, Lidia Souza was reunited with her 9-year-old son Diogo, after 26 days apart from him. Across the country, lawyers are fighting for the kids this administration detains. And for now, there still exist judges willing to check the administration’s un-American overreach. Think of the Hadwen Park Congregational Church in Worcester, where gay and transgender people fleeing persecution in the Caribbean and Africa seek help when they arrive in the United States. The church’s pastor, Rev. Judith Hanlon, has given succor, and vital footholds, to desperate souls who hear about the church by word of mouth. Think, too, of the many churches, synagogues, and mosques across this country welcoming the strangers. Think of the women and men working so hard to keep abortion safe and legal — even as those who would outlaw it celebrate the departure of Supreme Court Justice Anthony Kennedy, who had held the line on abortion rights. Think of Liz Goodfellow, president of the Jane Fund of Central Massachusetts, which provides grants to women who cannot otherwise afford abortions. The nonprofit fields desperate calls from all over the country, from places where access to abortion is severely restricted, especially for poor women. When you start looking for them, the helpers, as Mr. Rogers would call them, are everywhere, each dealing with one small corner of the gloom that deepens around us. We need more of them with every passing day, of course. And they need more of our help. The big picture is bad, and getting worse. And nobody who is appalled at where this country is headed should stop fighting, no matter how bad things get. But working the small stuff is key here. It’s where sure victories lie, in ones and twos. And boy, do we need them.